The US Patent and Trademark Office has published two new related patents from Apple that suggest the company might be working on chemical smell sensors, which could have a variety of uses within healthcare. One patent even suggests that by analyzing sweat particles in the air the sensor could deduce blood sugar levels. The patent applications were submitted in late 2018 but were just published on Thursday of last week. 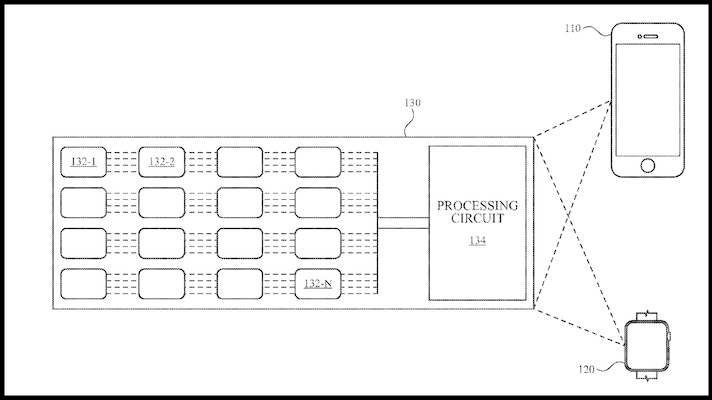 Apple Insider first spotted the patents. The two patents describe two different sensors, presumably intended to work together. One (compact particulate matter sensor) would use lights and photodetectors to "see" particles in the air. The second (systems and methods for environment sensing) would be an array of ionic liquid sensors that could actually detect smells. A machine learning algorithm could help the device learn to distinguish between different smells. Both patents talk about incorporating the sensors into portable communications devices, which could mean phones, tablets or smartwatches. The particulate matter sensor is described as having a number of possible applications, some related to health. "Gas sensors can help the mobile electronic device to detect various environmental gases such as carbon dioxide, carbon monoxide, ozone, volatile organic compounds (VOCs) and the like," the patent says. "Particulate air pollution is shown to have consistent association with illness exacerbations in people with respiratory disease as well as the rise in the number of death cases resulting from respiratory and cardiovascular disease among older people." Perhaps the most interesting, in light of old rumors that Apple is working on a noninvasive glucose sensor, is a reference in the second patent to potential applications for sensing blood sugar. "There are electronic devices that can detect an analyte in fluids (e.g., liquids, gases and vapors) with the help of pattern-recognition. However, there are no portable communication devices that can mimic users' senses for smell and taste," the patent says. "The ability to smell various flavors when combined, for example, with photo recognition can open a new horizon to smart device applications. The new applications may be in a number of areas including health, safety, security, networking and other areas. For example, in the health and safety areas, a smell-enabled (e.g., e-nose) smart communication device may be able to alert users about dangerous levels of gases such as carbon monoxide, natural gas and other toxic and/or hazardous gases, or measure compounds in human sweat and alert the user about his sugar levels, for example." Of course, patents are a notoriously poor predictor of a company's product pipeline, especially when a company is as large and well-resourced as Apple. While some percentage of them will emerge as fully fledged projects, others can represent areas of interest that are ultimately abandoned. Over the years, we've seen Apple patents for blood pressure monitoring on the wrist, vital signs detection using the iPhone's camera, health sensors in Apple AirPods, and a spectrometer for detecting sunscreen (and telling people when to reapply). That said, Apple is always iterating on its products and has lately been talking up healthcare as an important area for the future of the company.